We would like to welcome the yacht "The Annex" into the charter yacht fleet. There will be a third crew member when the charter is a group of 9 or 10 guests. The Annex is one of the few charter sailing yachts that is registered for fishing in the British Virgin Islands. Shane and Anne are a young, enthusiastic couple who will ensure you feel comfortable and at ease on board. They share a love and passion for the ocean and also share the exact same birthday. Born hemispheres apart, they met in South Africa and sailed together over 6000 Miles from Cape Town to their new home in the Caribbean. These two are a professional and hard working team who enjoy living life to the fullest. If you are a group of 9 or 10, PLEASE book early as there are not many yachts that accommodate more than 8 guests. "The Annex" is already booked for the 2016 holidays of Christmas and New Years. The charter catamaran Castelina II, a 44-foot Lagoon for up to 6 guests, has a special offer this summer. 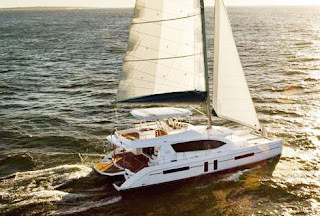 Castelina II is a 44-foot Lagoon catamaran with a crew of two. The yacht is fully air conditioned and has a small flybridge atop of the aft cockpit, plus a seating area behind the trampolines. Castelina accommodates up to 6 guests in 3 Queen cabins, each with ensuite head/shower. Check out Castelina's electronic brochure... CLICK HERE.